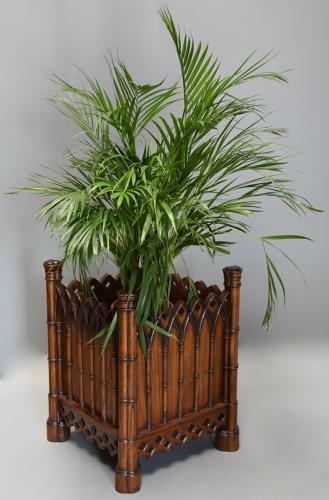 This planter consists of four Gothic style corner supports with trefoil decoration to the top with Gothic style arched gallery with pierced quatrefoil design. This leads down to a frieze below with pierced quatrefoil decoration and diamond design, all supported on quatrefoil shaped plinths. This planter is in excellent condition for age, is of stable construction and can go straight into a home - it s a very versatile piece as could be used as a planter in a conservatory or entrance hall or equally for storage of wood, logs etc.